This is an 11 track remix promo cd, containing the Radio Edit of Tinseltown To The Boogiedown, the Album Version, “Dead Certainty” and 8 remixes (variations) of Tinseltown To The Boogiedown by the likes of producer Psycho Les, hiphopster Pete Rock, DJ Rob Swift and Ali Shaheed Mohammed (one of the founding members of A Tribe Called Quest). My personal favourite is the Rob Swift Variation, who gives the tune a spin with a catchy dancehall style beat and a recurring scratch sound. 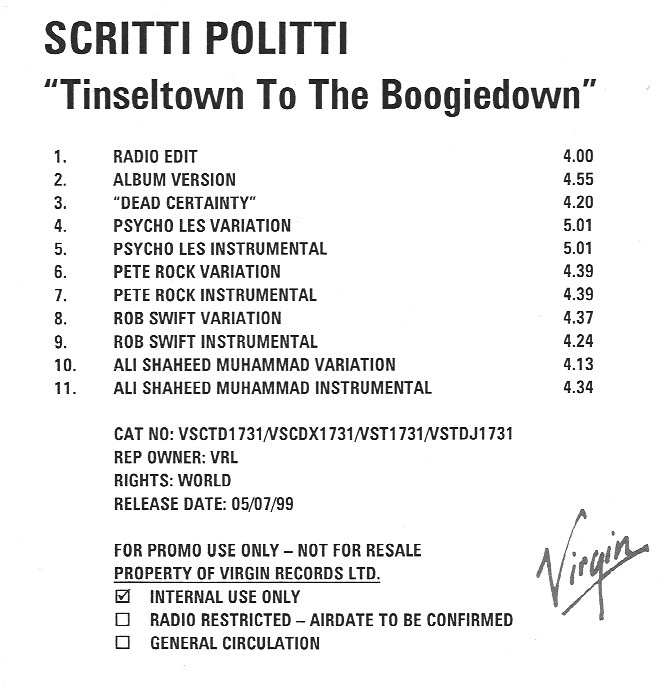 Under the category “Rarities” we will regularly present Scritti Politti collecters items and rare objects. A similarly comprehensive promo of TTTB recently sold for GBP16 on eBay. I think the difference is that this is for record label use, whereas the was a conventional radio promo.